Occurs when a stray light source illuminates the optics or some hardware that the focal plane sees. 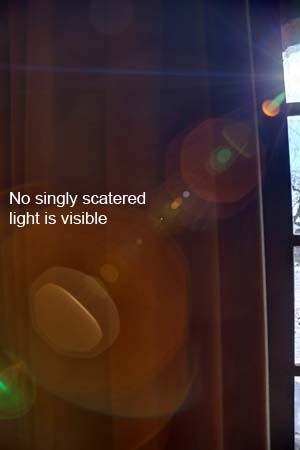 Some portion of the light will scatter into the field of view and become stray light. Once in the field of view, there is no way to eliminate it. With the camera put in this upside-down orientation with respect to the bright sources of light, there is almost no very bright and scattered streak of light on the right of the image (compare with the image on the left below). The whole image was covered with a nearly uniform (definitely normal though)veiling glare before automatic contrast correction in post processing. The veiling effect could hardly be seen by peering through the viewfinder of the camera. 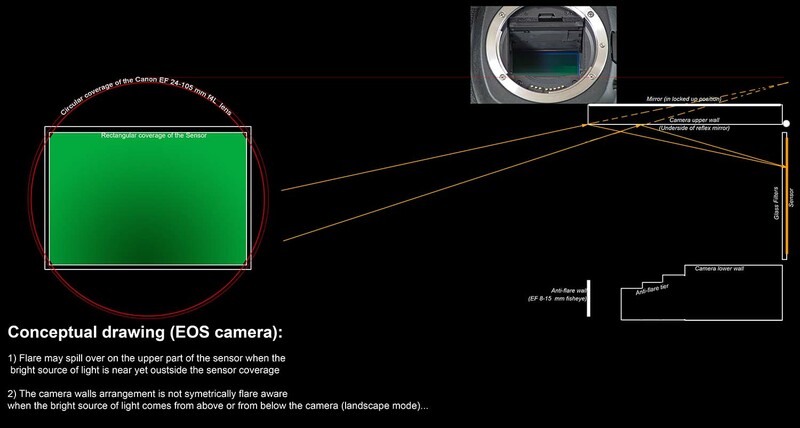 View a conceptual drawing that show why some stray light from critical object space does not hit the sensor surface. The sun was here shining from the underside of the camera on the right of the image. With this usual orientation (shooting photos for panorama stitching), there is a spectacular very bright and scattered streak of light on the right of the image (compare with the image above). This bright thick line is nearly perpendicular to the side of the image. 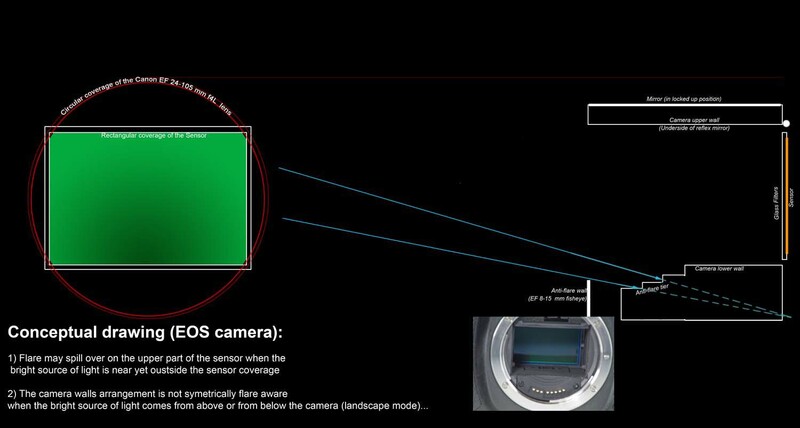 All these concomitant observations tell us that the flare (veiling glare) effects are due mainly to scattered reflection from the backside of the camera mirror flap. Light is bouncing before striking on the sensor. The elongated shape of the streak is due to the grooved grating. Some additional diffraction may well have possibly occured at the sensor edge though. View a conceptual drawing that show why some stray light from critical object space may actually hit the sensor surface mainly via specular reflection. 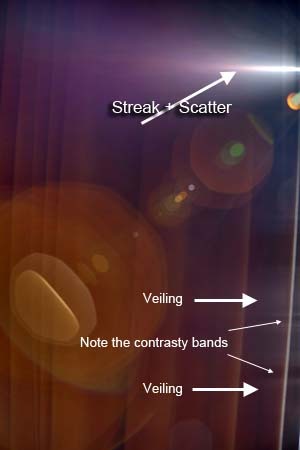 The violent streak cannot be seen by peering through the viewfinder of the camera.